With the US-Pakistan relationship in turmoil, and hopefully resetting itself to a healthier, more equitable and less dependent one, our usual conventional lack of wisdom has it that America has painted itself into a corner by making us no longer dependent on it while remaining dependent on us to get it out of Afghanistan. It’s never quite that simple. No matter how great the political, economic and financial decline of the most powerful country in history, it will still remain the most powerful for some time yet, a huge market, and most importantly, possessor of the greatest knowledge bank. It would be foolhardy to have an adversarial relationship with it, forget no relationship at all, but it takes two to tango. It is moot whether America is a worse dancer or we are. America’s scientific and technological advancement is greater than most people imagine. This knowledge it has used in certain areas, some good some bad. A good one that springs to mind is medicine, particularly surgery, including its advanced tools. Another is the Internet, which has made communications so easy and quick that the post office, already out of fashion, will soon go out of business altogether. It has opened vast information and knowledge banks for all peoples of the world for virtually free, a most admirable achievement indeed. But at the same time, the Internet’s social pages being spawned have also become the most modern weapon so far, for it conquers hearts and colonises minds and keeps people constantly tagged and under watch. How many young people do you run into from the boondocks that study in local schools and have never even been to Karachi, let alone to America, speaking with comical American accents? The worst areas that knowledge has been used for are making weaponry. It has been so since the advent of Man. America is compelled to do this, and also start wars, to feed its vast military-industrial complex that is the engine of its economy. It still lives in the outdated paradigm that the only way to gain economic advantage is by establishing hegemony over the world. Time to shift this paradigm, and only America has the wherewithal to do this. It tried by shifting to ‘consensual hegemony’ rather than European-style coercive hegemony, but when it became the sole superpower it went hyper and fell back on coercive hegemony like a rooster goes for hens after being caged for a time. It’s not easy to change because gaining economic advantage emanates from that most primeval instinct of man – survival. America has given more money to the world than any country before, but it failed to win hearts, minds and admiration because of its shrill bullying that is part of its personality. The much-acclaimed book, ‘The Ugly American’, described this shrill bullying. America’s societal advancement (as indeed the advancement of the entire world) is comparatively far less, particularly its economic and financial systems, which were dynamic once but have since become static and exploitative. So has its political system that at one time produced admirable leaders but is today spewing out the sort of leadership we have before us. This is where America has taken a self-inflicted beating, reinforcing the notion that the very powerful cannot be beaten from the outside but fall from within because of inevitable decadence and hubris and the end of dynamism. Dynamism is lost when people think that, “We have arrived and nothing and nobody can challenge us so we don’t need to change.” This mindset leads to a certain kind of mental lethargy that makes one stick to the tried and tested that worked for a while but is now worn out and stale and so is failing. People and the world change constantly, so what was credible once is no longer even plausible. Though no longer a ‘neocon’, US hubris was reflected in the title of Francis Fukuyama’s book, ‘The End of History and the Last Man’ that was published after the collapse of the Soviet Union. ‘End of History’ says it all. How can one even contemplate such an outlandish notion unless one is completely zoned out in the throes of intellectual hubris and mental lethargy? So long as there is time and dialectics, history will never end. We romantic Pakistanis never got one thing straight: there is no such thing as ‘friend’ in relations between states, only temporary allies in a common cause that serves all parties. The minute that cause ceases or ceases to be common, the alliance either ends or its intensity decreases. For one state to expect a continuing special privileged relationship and preferential treatment from another because at one time they were allies in a particular endeavour doesn’t make sense. The problem is that for us alliances are more like romances that don’t cease because we live in that fool’s paradise that was especially made for one-way romantics. Which is why America cannot understand why we keep on dredging up our common history. In the sense of romance, history for us doesn’t end. We remain mired in it. We should know that when alliances end another history begins. We Pakistanis suffer from the courtier culture of India’s princely past – please the prince and many vistas will open up. But courtier culture becomes decadent and contrary when it is thrown into a contemporary milieu – trying to live in the past and the present at the same time. When we try and treat America like the potentate of a princely state it gets befuddled, unlike their European cousins who themselves come from a courtier culture and which is one reason why they remained our masters for so long. The courtier culture also keeps us mired in western political constructs for they were our last princes. That begs the question: what is the eastern political construct, or a modern Muslim one for that matter, that we could fall back on after 90 years of colonisation? While one can make fumbling assertions about some Muslim construct or the other, we will find nothing in the present that suits the times. I know about Turkey. Our last political construct was dynastic rule, which still prevails in most Arab countries regardless of what title potentates bestow on themselves, and in our own political culture of the subcontinent where we have political dynasties. That is how backward we are. The only eastern country to have forged a distinct and modern political system of its own is China. We remain stuck in ended histories, like our undoubtedly great Muslim past (“Muslims have a great past but no future”) or our past favours to the US – what we did for it in Afghanistan or by opening our door to China. What America cannot understand is why we didn’t insist on larger pieces of flesh at the time: Yahya Khan’s servile statement to Nixon comes to mind when after his famous China visit Nixon asked what he could do for Pakistan. Our portly general-president replied in a haze: “It was good to be of service, sir”. We think that such talk will put us on a pedestal and we will get more in return than even what America had in mind. That could have happened with the ‘Nabob of Boogaland’ in the 19th century, but no longer. Our mentality is that if we stake a claim to greater benefits in a particular joint venture, we are ‘selling’ ourselves. This sort of thinking comes from the courtier-courtesan mentality that has not left us, even though princely states and fiefdoms have. Today’s world is ruthless and no place for any goody two shoes. Pakistan and America have more than one thing in common. One is that we are both expert gravediggers – of our own graves. What we consider self-interest is self-destruction. In bombing countries to smithereens and occupying them for a while, America might cause regime change, but by destroying their infrastructure and slaughtering thousands of people they turn angry mobs into nations, causing themselves greater harm. What we thought would be good for us by joining the ‘war on terror’ because it would help rid us of terrorism in our own country has boomeranged: today large chunks of our people feel disenfranchised and disheartened with Pakistan and terrorism has increased the world over. Don’t be sad: learn. 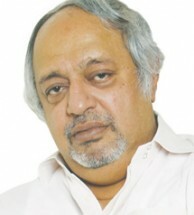 Humayun Gauhar is a veteran columnist in Pakistan and editor of Blue Chip magazine. Brilliant masterpiece SHARE~ with friends in the West ONLY Disagreement America can & should look forward, more long term I am in sales there is the attitude when you sell ONCE and the customer never comes back, no more business no taking care of complaints VS an on going business where you make a little bit every month over a long period and help the customer with technical issues etc. Right now for America to turn tail & leave Afghan with NO opening of the truck route via Karachi and no wrap up of the weapons in Afghan/Iraq will come to BITE us in the behind real bad. Britain I think was successful for a long time because its leaders were not bogged down with the TODAY!! Agree about the leadership or lack of; Look at the GOP Presidential candidates like the bafoons Caine the womanizer and Perry with no memory and even the front runners. If you have not seen the hilarious debates live TRY Youtube or other web sites Hilarious and morbid at the same time with their stupid onemanship on Iran Mitt saying constantly "I will make our military so strong no one will dare attack us" What do we have now?? He has never heard of asymmetric warfare Or that dog don't hunt in Texas!! Humayun Gauhar! Your article is a masterpiece of our historical behavior and personal delusion. Yes, we do live in that period of history and cannot get out of it. Paragraphs 3, 4, 6, and the remainder of the write-up; especially forming dynasties and acquiring titles, is something to be rid-off and read with full comprehension. After that comes implementation, which, fearing is a distant light on the horizon. The language used is free flowing and easy and pray, it receives appreciation not only by a commoner like me but is read and implemented by the future leaders of our country. Tyranny of history is that ghost writer of Mush is talking of principles and you are publishing his column. Pakistan does not seem to learn from its past failures even now. As a nation it has never even thought of becoming self sufficient. It has been dependent on USA from the very beginning and even now it looks towards China whenever in difficulty. It is not possible to keep your independence without being self sufficient. The reason for joining the war on terror was explained personally by Musharraf; to protect our Strategic assets. That was an open admission that Pakistan was not able to protect those assets except by becoming a US stooge. Where is Ghairat in all this? Pakistan will become a great nation; the day we forget our past, good and bad, spread over a thousand of years. Learn to live in a peaceful present and prepare for the future. In a country short of power, street light keeps on going well over 2-3 hours after sunrise. Where those who can't afford are still having scores of children. Where natural resources like drinking water are continuously being wasted. Let's be nationalist; dedicated to our country only. Only excel in science and technology will lead us to a viable future.